Survivor: Blood vs. Water (2013) - 8th place, 13th out - 4th juror. Eliminated by drawing rocks in Episode 12, "Rustle Feathers" (Day 32). Eliminated in a duel in Episode 13, "Out on a Limb" (Day 33). Cumulative totals: In-game - 32.5 days; Redemption Island - 1 day (1 visit). Blood vs. Water Ep. 1 RC/IC: "Blue Lagoon Bustle" - Part of Tadhana's puzzle-blowing team, Tadhana loses. Blood vs. Water Ep. 2 RC/IC: "In The Barrel" - Gets rolled in a barrel, establishing an early lead, but Tadhana loses again. Blood vs. Water Ep. 3 RC/IC: "Sumo at Sea" - Loses her bouts against Laura B. and mom (Tina); Tadhana loses again. Blood vs. Water Ep. 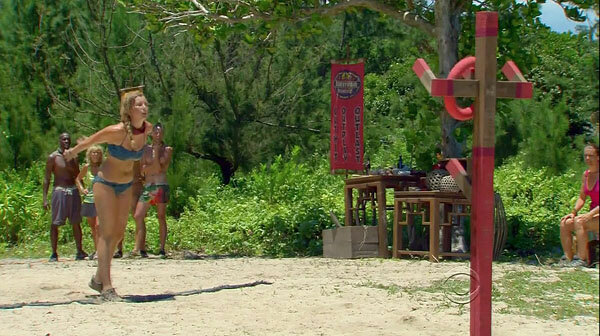 4 RC/IC: "Boats, Brains and Brawn" - Paddles for Tadhana, Tadhana loses again. Blood vs. Water Ep. 5 RC/IC: "Slide Show" - Beats Kat in her heat, and at long last, Tadhana wins, 5-2. Blood vs. Water Ep. 6 RC/IC: "Buoy Oh Buoy" - Now with New Galang, swims, and Galang loses. Blood vs. Water Ep. 7 RC/IC: "Chain Reaction" - Gathers bags for Galang, and again, Galang loses. Blood vs. Water Ep. 8 IC: "Flash Back" - Eliminated on the third item (tie-9th/11). Blood vs. Water Ep. 9 Final 10 IC: "Pesky Palate" - Eliminated in the first round (bottom 4/10). Blood vs. Water Ep. 9 Final 9 IC: "Balancing Point" - Katie wins! (1st/9). Blood vs. Water Ep. 10 RC/IC: "Splash Back" - Fifth person to drop out (4th/8). Blood vs. Water Ep. 11 IC: "Wrist Assured" - First person to drop out (4th/4). Blood vs. Water Ep. 12 RC/IC: "Ram-Ball On" - Somewhere at the back of the pack (bottom 3/6). Blood vs. Water Ep. 13 duel: "Jail Break" - Drops her key and finishes last; is eliminated (3rd/3). Blood vs. Water, Ep. 1 (Day 3): Marissa Peterson (voted out, 8-1). Blood vs. Water, Ep. 3: John Cody (voted out, 6-1). Blood vs. Water, Ep. 4: Brad Culpepper (voted out, 3-3 [3-1]). Blood vs. Water Ep. 6: Kat Edorsson (voted out, 5-1). Blood vs. Water Ep. 7: Laura Boneham (voted out, 4-1). Blood vs. Water, Ep. 9 (Final 10 vote): Vytas Baskauskas (voted out, 8-1-1). Blood vs. Water, Ep. 10: Laura Morett (voted out again, 7-1). Blood vs. Water, Ep. 1 (Day 1): One vote, from Rachel. Blood vs. Water, Ep. 1 (Day 3): One vote, from Marissa. Blood vs. Water, Ep. 9 (Final 10 vote): One vote, from Ciera. Blood vs. Water, Ep. 10: One vote, from Laura M.
Oh. Great. We get to vote someone out now? Picking off a toenail with Ciera. Fun! Hey, we might actually be able to win this! Yay, Vytas beat Aras, too! Oh. Laura B just told Vytas he's going. Hmm. Happy to have received the clue from Vytas. Not gonna burn this one. Yay! I have an idol clue! Things are gonna start happening to me now! That was great. I love visitors. Wait, YOU have it, Ciera? Stop talking about rocks, people! You could be 1,2, or 3 with us, Ciera. Gordon Holmes at XfinityTV.com (9/4/13): "Tina & Katie: 'I May Have to Vote Her Off'"
Rob Cesternino at RobHasAPodcast (12/12/13): "Talking with the Latest Person Eliminated from Survivor"
Gordon Holmes at XfinityTV.com (12/12/13): "Katie: Ciera Is 'So Good at Lying'"
Dalton Ross at EW's Inside TV Podcast (12/12/13): "Katie from Survivor on pulling the dreaded white rock"
"The Australian Outback winner Tina did not have to sugarcoat the experience to get her daughter to agree to play. 'She gave me the honest truth,' says Katie. 'She didn't glamorize it. She said, "It's going to be the toughest thing you ever do. You're gonna starve. You're gonna be in the elements. And you're gonna lose a lot of weight."' Adds Tina, 'And I may have to vote you off. It's the equivalent of a mother eating her young.' But Tina may already have targeted someone else: 'I think Tyson will definitely be a villain on this season. And it's not just that he just doesn't seem to be all that loyal. It's also that he's kind of mean and hateful.'" What Does It Mean to You to Play Survivor with Your Loved One? My Mom is the single most amazing person I know. To play Survivor together definitely tops any experience we have ever had together. I can't wait to compete with or against this truly amazing woman, as a daughter and a best friend, it's an honor!"